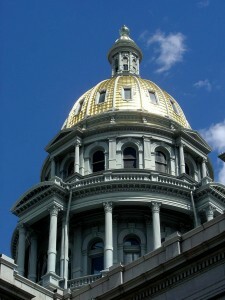 Colorado Peak Politics | GUN CONTROL UPDATE: Where Are the Bills in the Legislature? GUN CONTROL UPDATE: Where Are the Bills in the Legislature? UPDATE 3: All four gun grab bills have now passed the House and are on to the Senate. A number of Democrats opposed each bill, but never enough to stop the legislation. It’s cute how they think their meaningless opposition won’t stop them from being tarred with their caucus’s anti-gun agenda come 2014. UPDATE 2: House Democrats squeak HB1228 by — a bill to charge gun owners to have a background check — 33-32. Rep. Diane Mitsch Bush engaged in a bit of cynical CYA, ensuring it passed while trying to avoid the blame back in her district. UPDATE: The Divided Democrats of the Colorado State House barely passed HB1224, the ban on magazines that would hold more than 15 rounds, in the House this morning (34-31). With three Democrat defectors, it would appear that the bipartisan position on this issue was to oppose extreme gun controls. Democrat Reps. Ed Vigil (San Luis Valley), Steve Lebsock (Thornton), and Leroy Garcia (Pueblo) joined Republicans in voting “no” on HB1224. See the vote tally here. On Friday night, the legislature plowed through the Second Reading of four pieces of gun control legislation. Specifically, the bills the Democrats passed on Second Reading were HB1224, HB1226, HB1228, and HB1229. It is important to note that these bills have not yet passed in the House, only passed the Second Reading. The final and official votes on these bills will occur today. As a refresher, HB1224 is the bill that would ban magazines that have a capacity of more than 15. HB1226 adds college campuses to the list of places exempt from concealed carry allowances. HB1228 and 1229 require background checks on all gun sales and transfers, and then, require that the new owners pay for the background checks. Currently, Democrats enjoy a 37-28 majority in the State House of Representatives. In order to stop any or all of these bills from moving forward, five Democrats would have to vote with Republicans on the measures. But, will any of the Democrats waver after receiving calls from Vice President Joe Biden on Friday to tow the party line? There are a few contenders – Democratic Rep. Ed Vigil has been the most vocal about his opposition to gun control. Rep. Leroy Garcia opposes three of the measures. Rep. Steve Lesbock apparently opposes two of the measures. This thoughtfulness is in contrast to several more prominent Democrats who have publicly supported all four measures, including Democrats Rep. Beth McCann, Rep. Jovan Melton, Rep. Tracy Kraft Tharp, and Rep. Dan Kagan. The official vote, taking place this morning at the Capitol, will serve as a record of where each legislator falls on the various gun control measures. We need some good old, 1700/1800 rebellion to what is illegal and unconstitutional.